Since its creation in 1994, the Aldo Leopold Nature Center (ALNC) has helped connect many people, young and old, to nature in south-central Wisconsin. 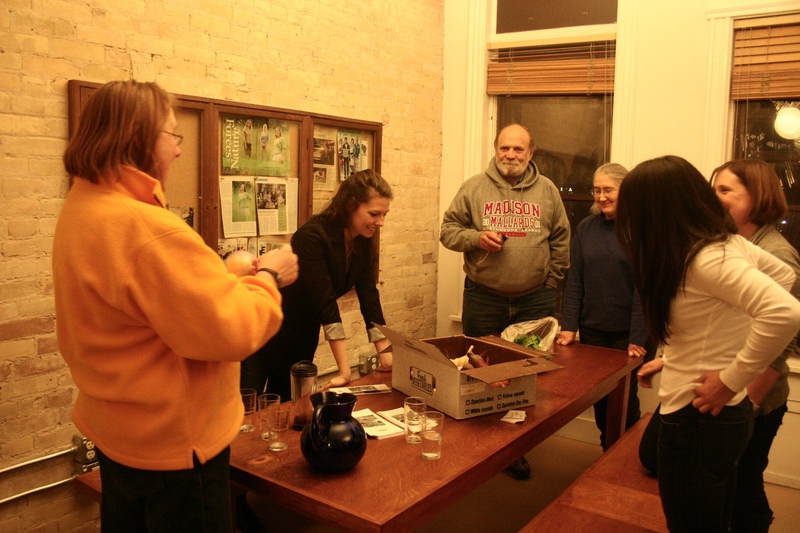 The center continues to successfully foster the development of a deeper understanding of the land for citizens of Madison and the surrounding areas in the way that naturalist, Aldo Leopold, did decades ago. Through programming including pre-school, summer camps, after school programs, public programs, special events, and more, ALNC has also fostered “admiration and respect for nature, and encourages sustainability and stewardship of the land”. The ALNC has two facilities that they maintain year-round for environmental education opportunities. According to the ALNC website the Monona Campus provides interpretive trails spanning 94 acres that lead visitors through a wide variety of ecosystems and habitats. The Black Earth Campus provides 38 acres of “rugged, unglaciated terrain” for hiking. Additionally, on both of these campuses, there are many buildings for programming and special events that visitors can take full advantage of. So this summer when you or your family is looking for an outdoor adventure to be able to enjoy Wisconsin’s environment sun up to sun down, look no further than the Aldo Leopold Nature Center. With your participation and with so much to offer on both campuses, ALNC is clearly leading the way to engage, educate and empower the next generation of stewards of the land for a healthy, happy and sustainable future. Recently we have addressed things going down our storm drains and their connection to our lakes along with the link between energy and water conservation. Today we are adding one more topic relating to healthy water. A lot of people do not realize that putting hazardous materials down the drain or toilet can have harmful effects on the environment, our health and can cause costly repairs to home sewer systems, as well as city systems. Even though an item says “flushable” Madison Metropolitan Sewerage District recommends throwing these items away instead. Another option, when possible would be to use reusable items that can be washed instead of thrown away or flushed. Examples: cloth cleaning rags, cloth napkins, reusable shopping bags. If you have items you are not sure how to dispose of or which things should not be flushed this helpful flyer will be able to answer questions as well as provide locations to take special items for proper disposal. You can also visit http://www.madswer.org or call 608-222-1201. Did you know that when you use water, you’re using electricity as well? In this area, most of the water that flows from your faucet and fills your toilet is supplied by city wells. These wells are maintained and operated by local Utility companies that pump and transport water to your home. Powering the wells has a cost which is paid by the Utility companies and then passed on to customers through utility bills. By conserving water we are not only helping ensure a healthy water supply but we are also contributing to energy conservation. Here are a couple indoor efforts you can take to save water, energy and money. A first step is to make sure that none of your indoor fixtures are leaking water. “For example, a leaky toilet can waste about 200 gallons of water everyday. As little as one drip per second can waste more than 3,000 gallons of water per year,” says Kristofer Canto, City of Fitchburg Sustainability Intern. Not only does this add unnecessary costs to your utility bill it is also using energy. A few places to check for leaks around your home include faucets, shower heads, washers, toilets and irrigation connections. One way to see if you need to check more thoroughly for leaks is (if possible) look at your water meter when you know none of your water using items are on. If the dial is turning, water is still being used. Installing an efficient toilet can provide equal performance while saving around 20 percent more water. Look for a WaterSense labeled toilet and it could save another $90 annually on a water utility bill and $2,000 over the lifetime of the toilet (based on a family of four). And if saving money on your utility bill isn’t enough of an incentive, the City of Fitchburg and the Madison Water Utility are offering Toilet Replacement Rebates! People can get up to $100 towards their new toilet if they replace older, less efficient toilets with a High Efficiency Toilet (HET) model. The HET toilets use on average 1.28 gallons of water per flush compared to some of the older models that use around 6 gallons per flush. That’s a big difference! Don’t live in Madison or Fitchburg? Try contacting your local Utility company to see what types of rebates they may offer. You never know! The Madison-based headquarters for American Family Insurance is set to become the first major private employer in Dane County to routinely divert food-related waste from the landfill. Very soon their food-prep scraps and used paper towels will be composted offsite. Maggie Layden was an intern with the company last year when she came up with the idea. She was hired permanently in January and now leads the composting program. This change is part of the company’s “zero-waste initiative” which features other sustainability goals established earlier this year. For now, American Family Insurance’s housekeeping vendor will be responsible for moving the organic waste from the kitchen to the compactor. 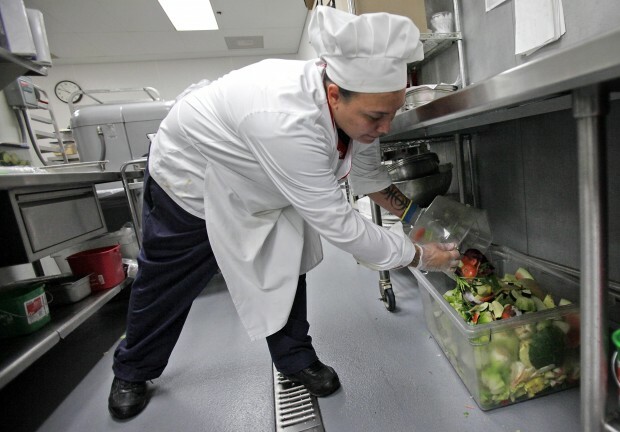 Eventually employees will be asked to participate in a more hands-on way by adding their food scraps to separate collection containers within the café area as well. American Family estimates they will generate around 40 to 50 pounds of food waste, along with 80 to 100 pounds in paper towels each week. This is on the low end compared to some other local businesses also participating in the pilot program. While establishing programs for businesses, the City of Madison has also been working on a pilot program for curbside collection of organic waste for residential areas. These projects are being led by George Dreckmann, the city’s recycling coordinator. His goal is to take the organics recycling pilot program citywide to all businesses and residents by 2016. It’s finally starting to look and feel like spring. Hopefully the trees can start budding in the next couple of days/weeks. To go with the theme of spring cleaning that we started with the last post, in this week’s blog, we’re going to focus on green cleaning supplies. You have to be able to do more than just remove junk from your house, and green cleaning suppies can clean your house while maintaining an air of sustainability. Some people will say, “What’s wrong with the conventional cleaning supplies that I’m already using?” These days, the stores have aisles full of cleaning supplies and many of them are full of things that no one would want in their home. We listed some examples of the toxins that are regularly found in conventional supermarket cleaners. Chlorinated phenols found in toilet bowl cleaners, are toxic to respiratory and circulatory systems. Diethylene glycol found in window cleaners, depresses the nervous system. Phenols found in disinfectants, are toxic to respiratory and circulatory systems. Nonylphenol ethoxylate, a common surfactant (detergent) found in laundry detergents and all-purpose cleaners, is banned in Europe; it has been shown to biodegrade slowly into even more toxic compounds. Petroleum solvents in floor cleaners, damage mucous membranes. 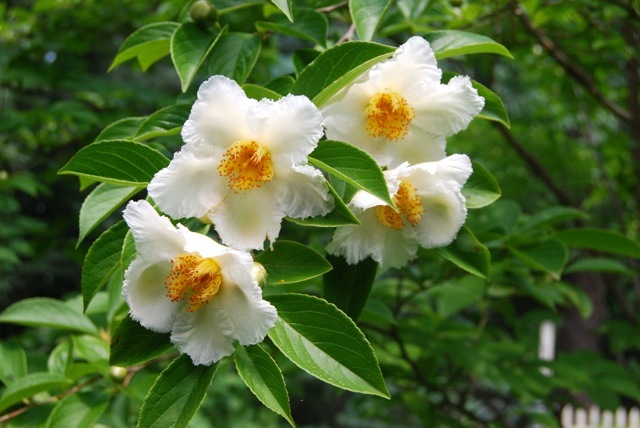 Butyl cellosolve, common in all-purpose, window and other types of cleaners, damages bone marrow, the nervous system, kidneys and the liver. The list could fill a book. And it’s a book that would include thousands of other chemicals — some so dangerous that they’re found on lists of chemicals associated with Superfund toxic waste sites and in the toxins section of the U.S. Clean Air and Water Acts. Reducing the amount of non-natural cleaner used in your home will reduce the amount of potentially hazardous chemicals while at the same time improving your local environment by preventing contamination to the outdoors. So now you’re wondering, “well if I can’t use those cleaners, what do I use?” There are still natural products on the market that you can buy in stores. Consumers must be wary though because not everything marked with words like “natural” or “green” actually follows their namesake. To help buyers out, websites like GoodGuide.com were started. Likewise, there is also the Green Seal Label that people can look for while at the store. Green Seal creates sustainability standards for products and offers certification for companies or products that meet the standards. You can trust that products marked with the Green Seal label are helping to create a greener marketplace. All-Purpose Spray Cleaner: Combine ½ teaspoon washing soda, a dab of liquid soap and 2 cups hot tap water in a spray bottle and shake until the washing soda has dissolved. Apply and wipe off with a sponge or rag. Tea Tree Mold Killer: Nothing works for mold and mildew as well as this spray. Tea tree oil is expensive, but a little goes a very long way. Note the smell of tea tree oil is strong, but it will dissipate in a few days. Combine 2 teaspoons tea tree oil and 2 cups water in a spray bottle, shake to blend, and spray on problem areas. Do not rinse. Window Cleaner: Put ¼ – ½ teaspoon liquid detergent, 3 tablespoons vinegar, and 2 cups water. Shake it up and use as you would a commercial brand. The soap in this recipe cuts the wax residue that many commercial brands leave behind. If you’re having difficulty finding recipdes for cleaning supplies, try looking on Care2.com in the “Healthy Living” section. How Local is Your Fridge? “What percentage of the food in your fridge is locally grown?” asked Kay Jensen of JenEhr Family Farm. The question was a simple one but one that all the attendees at the EnAct CSA event had to think about deeply. I personally had no idea. I liked to think of myself as a local food supporter, but did I really had a handle on exactly how I was supporting them? Numbers between 30 and 50% popped up as answers. Now that was one to think about. The benefits of getting involved in CSA, or Community Supported Agriculture are numerous, but above all you are showing support for local farmers. It is a way to reconnect with your food, to interact with those producing it, and to learn about the variety of produce out there that isn’t the usual grocery store line-up. It is a chance to renew the relationship between farmer and consumer. One touching story shared last night told about a CSA member’s young son, who states regularly that their CSA farmer “grew this food for him”. The interaction is an excellent way to teach children hands on about food and nutrition. I was also pleasantly surprised to learn that many health insurance companies offer rebates for subscribers due to the many health benefits of eating farm fresh vegetables. Of course with anything new, becoming a CSA subscriber takes some time and energy to adjust. Eating locally takes extra time and planning ahead, says MACSAC, or Madison Area Community Supported Agriculture Coalition, volunteer Angie Fuhrken. 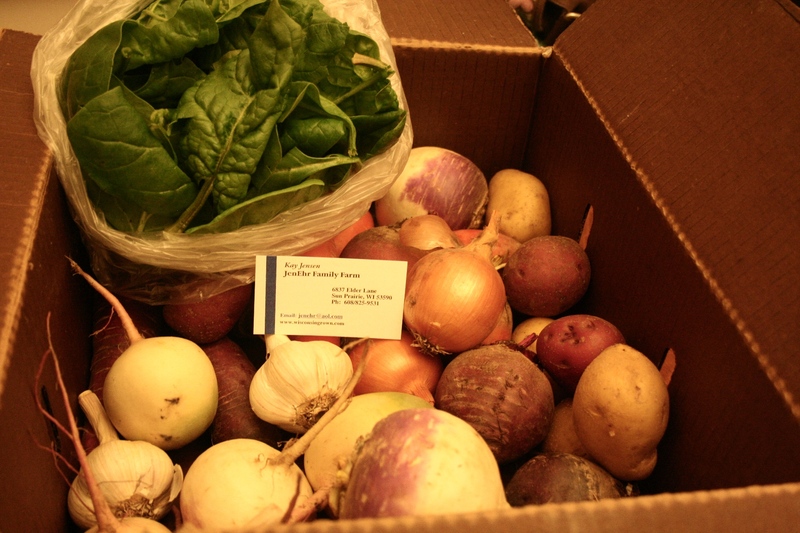 When she first signed on, she was a bit nervous after receiving a box full of vegetables she barely recognized. There are of course the usual favorites, but a lot of times the CSA box contains new items. After researching places to get recipes based on ingredient and with the help of MACSAC’s cookbook, she quickly adapted and now has a bigger variety of dishes to share with her family. With a little extra energy, you can adjust and figure out a system that works for you. 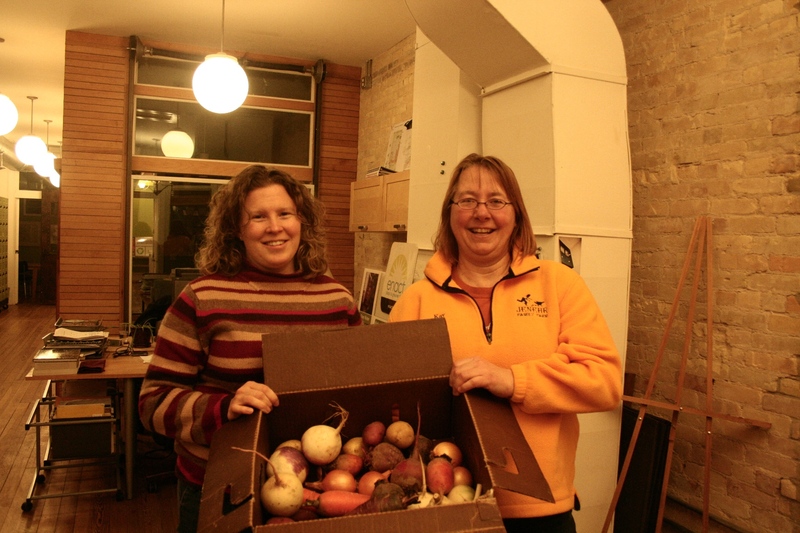 She also shares her CSA with a neighbor, helping to reduce waste. One week the box is picked up by her, and the next week, the neighbor. Both Kay and Angie made other suggestions such as choosing a farm with a convenient pick-up location for you, making a plan ahead of time if you are sharing with someone, and to be patient in the transition period while learning how to use all of your new vegetables. A typical 'winter' CSA box. The winter spinach has a sugary sweetness to it. So what percentage of local food do you want in your fridge? Is it there now? Do you have a plan to get it there? When considering all of your options, make sure to include CSA. For more information on CSA, visit http://www.macsac.org. Thank you to all who came out to the event last night and to Kay and Angie for giving us their time.